Morgan Stanley disagrees with the rest of Wall Street: The bank’s top strategists are gearing up for a much longer bear market while others are betting the sell-off is short-lived. Morgan Stanley is concerned that actions by the Federal Reserve and other central banks is drying up liquidity more than most market participants predicted, putting stocks in a precarious position. The Fed, which influences the financial markets by adjusting the overnight lending rate, has hiked interest rates three times this year and is widely expected to do so again in December. Some corporate officials have cautioned that between higher borrowing costs and an uncertain tariff outlook, 2019 could prove a tough year for stocks. Wilson pointed out that about half of all the stocks in the broad MSCI U.S. Equity Index are at least 20 percent below their 52-week highs. 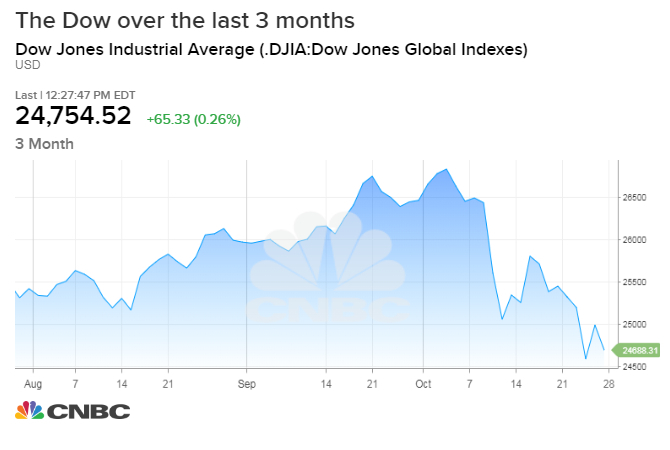 The S&P 500 is off more than 8.5 percent from its all-time high in September, while the Dow Jones Industrial Average is off by more than 7.6 percent. Some, such as Goldman Sachs’s equity chief, see the stock market sell-off over the past month as “overdone” and a buying opportunity. The rosier view from Goldman comes amid a largely solid economic backdrop. Third-quarter GDP rose 3.5 percent, according to a preliminary reading Friday. Still, Morgan Stanley has defended its forecast for dismal stock performance this year, even as the S&P 500 rallied 9.5 percent by mid-September. Since then, stocks have plunged more than 8 percent, erasing nearly all of their 2018 gains over than span of five weeks as the markets appear to reward Wilson’s persistence. “The rolling bear market is quickly moving to complete its job with growth stocks (Tech, Health Care and Discretionary) catching up on the downside and we don’t think it will be over until this gap is completely closed,” he wrote. Wilson’s bear case for the market of 2,400 implies more than 10 percent downside from current levels; his base case of 2,750 implies 3 percent upside.